The 1896 US presidential election has acquired new resonance in light of the recent up-surge in populism. This column combines voting results with economic, financial, and demographic data from the 1890s to offer a systematic empirical study of voting patterns in the election. The results confirm a role for identity politics, but also a role for economic factors. They also suggest, however, that a small or even moderate change in economic conditions would not have altered the outcome of the 1896 election, nor the subsequent course of American history. Bryan’s unconventional campaign eschewed the media, which was arrayed against him, in favour of a new approach designed to facilitate direct communication with the voters – the first nation-wide whistle-stop campaign. His fiery speeches, impassioned advocacy of bimetallism and fierce defence of the common people, appealed equally to Democrats and Populists, supporters of the third party of agrarian origin that arose out of dissatisfaction with the two establishment parties. Historians like Burnham (1966) and Schattschneider (1960) have argued that the 1896 election brought about a fundamental realignment of American politics. It inaugurated a third of a century of Republican dominance of the White House and Congress. It settled the tariff and free-silver questions for a generation (in favour of protection and the gold standard). Politician historians emphasise the role of ‘identity politics’ in the election: the split between urban and rural voters (where rural residents favoured the populist, Bryan); between Catholics and Evangelicals (where Catholics favoured McKinley), and between immigrants and natives (where Bryan sought to appeal to natives by channelling anti-immigrant sentiment). Economic historians, in contrast, lay weight on the Populists’ economic grievances. They point to the complaints of farmers about high mortgage interest rates and railroad freight rates (Eichengreen 1984). They point to depressed crop prices as a potential source of distress affecting the farm vote (North 1966). They cite the particular concerns of tobacco farmers about the monopsonistic marketing practices of the American Tobacco Company formed by James Duke in 1890, and of cotton farmers over what they saw as the exploitative nexus of sharecropping, debt peonage, and pressure to engage in monoculture. More generally, they emphasise that farmers were feeling ‘left behind’ as a result of their loss of dominance in what had traditionally been a heavily agrarian economy, and they were upset by a loss of control of their financial destinies as a result of the commercialisation and globalisation of the economy. Thus, it is striking that there exists no systematic empirical study of voting patterns in 1896. We therefore provide one in a recent paper (Eichengreen 2017). We combine county-level voting results with economic, financial, and demographic data from the 1890s. Our results confirm a role for identity politics. As we show, Bryan’s vote share was significantly lower in counties with a larger foreign-born share of the population. It was lower in counties with high manufacturing output per capita, reflecting the divergent interests of farmers and industrial workers. It was lower in counties with a high black share of the population, reflecting the attachment of black voters who retained the franchise to the Party of Lincoln. But, along with identity politics, economic factors also mattered. Bryan’s vote share was higher in countries where mortgage interest rates were high, burdening the farmers; where the density of railway lines was low, indicative of limited freight-rate competition; and where crop prices had declined by most in percentage terms over the preceding decade. The geographical distribution of these variables is shown in Figures 1 to 3. We know that the election was closely fought, but until now scholars have had little sense of whether changes in economic conditions – less favourable crop prices, higher mortgage interest rates, less freight-rate competition, more extreme climatic conditions – could have tipped the Electoral College balance in Bryan’s favour, notwithstanding suggestions by no less than Karl Rove (2015) that McKinley owed his victory to improving economic conditions. Notes: The figure maps out the reported average interest rate of the county in 1910. Red denotes larger values, green denotes smaller values, and blank counties denote those with no listed interest rates. Interest rates come from U.S. Bureau of the Census (1890). Boundaries obtained from Minnesota Population Center (2004). Notes: The figure maps out the number of railroad miles per square mile in 1890. Dark red denotes no railroads, orange denotes less 0 to 0.05, yellow denotes 0.05 to 0.1, light green denotes 0.1 to 0.5, and green denotes more than 0.5. Blank counties denote those with no listed railroad data. The number of railroad miles in the county comes from Donaldson and Hornbeck (2016) adaptation of Atack’s railroad database (2016). County population comes from Haines (2005). Boundaries obtained from Minnesota Population Center (2004). 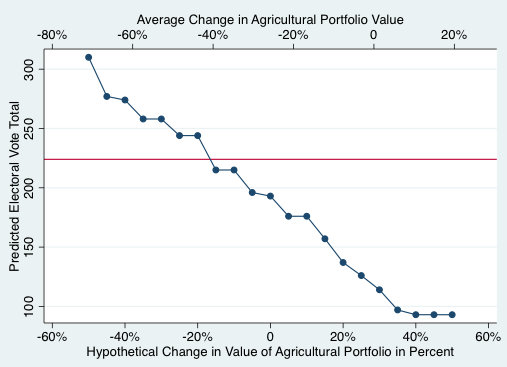 Notes: The figure maps out the percentage change between 1886 and 1895 in the value of the agricultural crop portfolio produced by the county in 1890. The basket consists of the county’s production corn, barley, oats, wheat, Irish potatoes, sweet potatoes, hay, rye, buckwheat, cotton, and tobacco, as recorded in the 1890 Census of Agriculture (Haines, Fishback and Rhode 2016) to which we apply the agricultural prices from Carter et al (2006). The colors denote the quartiles of the county-level distribution. Green is the highest quartile and denotes values above -15 percent. 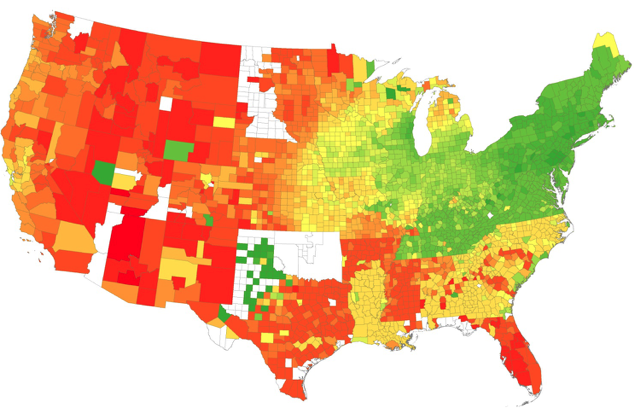 Light Green is the 50-75 quartile and denotes values between -21.8 and -15 percent. Orange is the 25-50 quartile and denotes values between -27 and -21.8 percent. Red is the lowest quartile and denotes values below -27 percent. Boundaries obtained from Minnesota Population Center (2004). Our estimates and counterfactuals suggest that further declines in crop prices and higher mortgage interest rates, but not still lower levels of railway penetration and competition, could in principle have tipped the Electoral College balance. While railway penetration mattered for voting patterns, its effect was quantitatively small, and there was no level of rail-line density low enough to shift the Electoral College in Bryan’s favour. In contrast, had gold not been discovered in South Africa in the 1880s and in Western Australia in the early 1890s and had the cyanide process for separating gold and impurities not been developed, agricultural prices might have continued to fall rather than rising, in which case the outcome of the election could indeed have been different. Our estimates suggest, however, that this further fall in prices would have had to have been very substantial for Bryan to win enough electors to capture the presidency. We show this in Figure 4, where we simulate the effect on the Electoral College of different agricultural price counterfactuals. Notes: Figure displays the counterfactual Electoral College votes that Bryan is predicted to have received as we vary the value of the agricultural portfolio of all counties. The counterfactual is based on model 5 of Table 2 of Eichengreen, et al (2017). The line denotes the 224 vote threshold value that Bryan would have needed to secure the presidency over McKinley. Similarly, our estimates suggest that even if none of the bank entry actually observed in the first half of the 1890s had occurred, resulting in a higher level of interest rates (banks per capita and their resulting competition being a significant determinant of the level of interest rates in this period; see James 1976), that increased level would still not have been enough to swing the election toward Bryan. One can also imagine a combination of counterfactual changes in economic variables altering the outcome of the election. 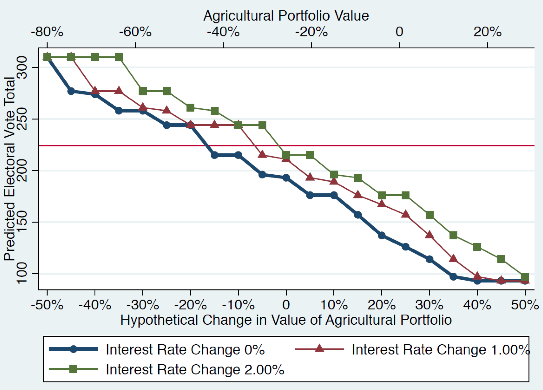 We show one of those combinations in Figure 5: a one percentage point increase in interest rates relative to prevailing levels, combined with an additional 10% decline in crop prices. The requisite changes remain substantial. Crop prices still would have had to fall half again as fast as they in fact did in the decade preceding the election. Fourteen fewer banks per county, as needed to raise the level of interest rates by one percentage point on average, is still a large multiple of the observed rate of bank entry between 1890 and 1896. Notes: Figure displays the counterfactual Electoral College votes that Bryan is predicted to have received as we vary the value of crop prices of all counties, given different assumptions about counterfactual interest rate changes. The counterfactual is based on model 5 of Table 2 of Eichengreen, et al (2017). The line denotes the 224 vote threshold value that Bryan would have needed to secure the presidency over McKinley. There is no question that economic grievances were salient for voters in 1896. But a small or even moderate change in economic conditions would not have altered the outcome of the election, nor the subsequent course of American history. Atack, J (2016). “Historical Geographic Information Systems (GIS) Database of U.S. Railroads for Selected Years ”. Burnham, W D (1965), “The Changing Shape of the American Political Universe,” American Political Science Review. Carter, S, S Carter, M Haines, et al. (2006). Historical Statistics of the United States: Earliest Times to the Present, Millennial Edition. New York: Cambridge University Press. Dustmann, C, B Eichengreen, S Otten, A Sapire, G Tabellini and G Zoega (2017), Europe’s Trust Deficit: Causes and Remedies, CEPR Press. Eichengreen, B (1984), “Mortgage Interest Rates in the Populist Era,” American Economic Review. Guiso, L, H Herrera, M Morelli and T Sonno (2017), “The Spread of Populism in Western Countries,” VoxEU.org, 14 October. Haines, M (2005). “Historical, Demographic, Economic, and Social Data: The United States, 1790-2002 ,” ICPSR02896-v3. Ann Arbor, MI: Inter-university Consortium for Political and Social Research, 2010-05-21. Haines, M R, P Fishback, and P Rhode (2016). “United States Agricultural Data, 1840-2012. ” ICPSR 3520635206-v3. Ann Arbor, MI: Inter-university Consortium for Political and Social Research, 2016-06-29. James, J (1976), “Banking Market Structure, Risk, and the Pattern of Local Interest Rates in the United States, 1893-1933,” Review of Economics and Statistics. Minnesota Population Center (2004). National Historical Geographic Information System: Pre-release Version 0.1. Minneapolis, MN: University of Minnesota. http://www.nhgis.org . U.S. Bureau of the Census (1896). Eleventh Decennial Census of the United States, (1890). Vol. XIII. Report on Farms and Homes: Proprietorship and Indebtedness in the United States. Washington, D.C.: Government Printing Office. North, D (1966), Growth and Welfare in the American Past, Prentice-Hall. Rove, K (2015), The Triumph of William McKinley, New York: Simon and Schuster. Schattschneider, E E (1960), The Semisovereign People: A Realist’s View of Democracy in America, Holt, Rinehart and Winston.